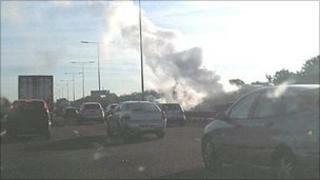 Motorists faced rush-hour delays of 90 minutes because of a lorry fire on the M5 motorway in Worcestershire. The fire in the lorry, carrying concrete and steel, started at 0655 BST between junction 4A, where the M5 meets the M42, and junction 5, at Wychbold. Delays peaked at about 0830 BST and involved drivers between Frankley services, between junction 3 and 4, and junction 5 southbound. All lanes going southbound were open by 1020 BST. Crews from Droitwich, Bromsgrove and Northfield, from the West Midlands service, were deployed and the fire was under control by about 0745 BST. One lane southbound had reopened at about 0730 BST and another was back in use from about 0800 BST, the Highways Agency said. There were delays of about 30 or 40 minutes on the M42 westbound in the rush hour as a result of the incident. Earlier, station commander Steve Fox, from Hereford and Worcester Fire and Rescue Service, said: "The fire broke out in the rear axles of the trailer section and caused extensive damage to the flat bed structure of the lorry. "It is not safe to be driven and so its load of steel will need to be decanted onto a replacement vehicle."